An old Native American legend tells of how the Siwanoy Indians struggled with Habboamoko, the devil, for possession of the area that is now Connecticut. While Habboamoko had many tricks, the Siwanoy, through their own potions and wizardry, were able to back the old devil up against Long Island Sound. Things were looking rather bleak for Habboamoko, until he glanced over his shoulder at low tide toward Long Island and noticed a trail of stepping stones. Wasting no time, he sprightly danced across the rocks and fled to Long Island. So angry at the Siwanoy was Habboamoko that he flung every boulder he could find back across the sound. His aim was not true, but his power was strong, and the boulders were flung as far as Maine, littering New England with rock formations. During the 1860s, shipping commerce in Long Island Sound increased greatly, and with it, so did the need for a lighthouse to define a clear channel through the sound’s western end. 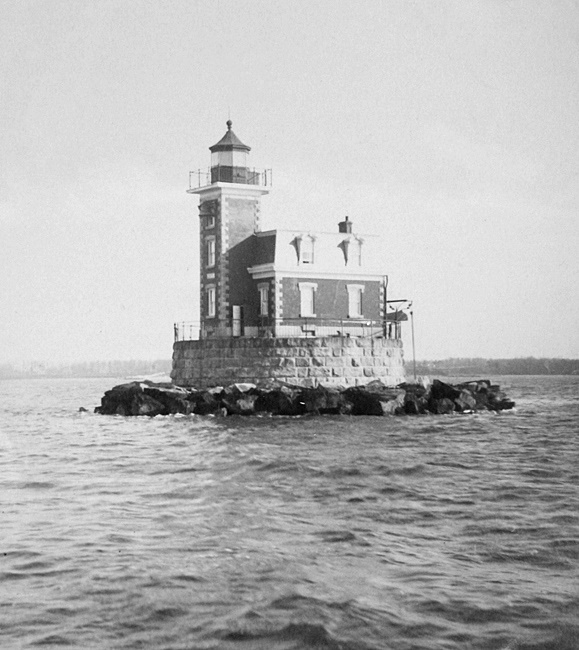 Congress appropriated $6,600 in 1866 for a lighthouse on Hart Island, but the owner of the desired land was unwilling to sell at a reasonable price, so condemnation proceedings were begun. The appraiser determined a fair price for the five acres was $25,000, a sum that exceeded, by far, the appropriation and which the Lighthouse Board deemed was well beyond the intrinsic value of the property. 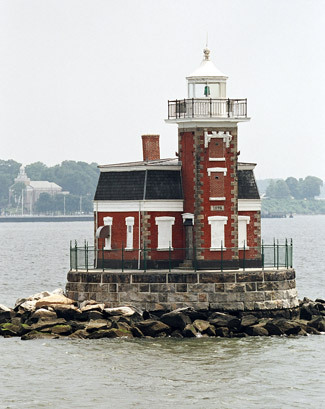 On closer examination, the Board determined that the southern tip of Hart Island was not ideal as it was quickly eroding away, and instead, it requested an additional $50,000 to place a lighthouse, similar to those recently built on the Hudson River, on the end of the reef making out from Hart Island. Congress provided the extra $50,000 on June 10, 1872, but when the State of New York could not cede the end of the reef, the most westerly of the group of rocks known as the Stepping Stones was selected instead, there being no question of its riparian ownership. Construction of a Second Empire style lighthouse, a sister to Hudson-Athens Lighthouse on the Hudson River, began in 1875 with the laying of riprap on the rock, which lies just below the water’s surface. Under the direction of A. D. Cook, Stepping Stones Lighthouse was constructed by Irish bargemen and stonemasons from Throggs Neck. The concrete and riprap foundation, encased in rough-hewn granite blocks, has a base diameter of forty-eight feet, and the lighthouse rises to a height of forty-nine feet above the sound. The redbrick keeper’s dwelling is topped by a mansard roof and attached to a square tower. Every outside corner of the structure is decorated with granite quoins, giving the lighthouse a more imposing presence. Findlay Fraser lit the tower’s fifth-order Fresnel lens for the first time on March 1, 1877, and when necessary, would start the machinery that tolled the station’s fog bell a double-blow every twenty seconds. The original characteristic of the light was fixed red, an appropriate choice for the Devil’s Stepping Stones, but in 1932, the light was changed to a fourth order-Fresnel lens with a fixed green light. A modern optic, which produces a flashing green light, was placed in the lantern room when the lighthouse was automated in 1964. Two keepers, a head keeper and an assistant were initially assigned to Stepping Stones Lighthouse, but the position of assistant was abolished in 1879, when James Scott was promoted to replace Fraser as head keeper. Keeper Scott started his career in the Lighthouse Service as a cook aboard Stratford Shoal Lightship, where he served from 1859 to 1863 before leaving to fight in the Civil War. Scott was involved in many battles, but came through the conflict without suffering any injury. In 1867, he resumed his lightship career and served as a seaman and mate for ten years before being appointed second assistant at the new Stratford Shoal Lighthouse, which replaced the lightship. In 1878, Scott was promoted to assistant keeper at Stepping Stones Lighthouse. During his three years at Stepping Stones, Scott was credited with saving three lives. In 1880, Scott returned to Stratford Shoal Lighthouse as head keeper, and then five years later, he was appointed head keeper of Montauk Lighthouse, a position he held for twenty-five years before retiring in 1910 at the age of seventy. A ship approaching New York City’s East River can take a clear channel by keeping south of the lighthouses on Great Captain Island and Execution Rocks and then staying north of Stepping Stones Lighthouse. In December 1888, Keeper Cornelius Douglass was returning to the lighthouse one evening after purchasing supplies on City Island. The weather was intensely cold and blustery, and a nasty cross-sea was running in the sound. Keeper Douglass neglected to reef the sail of his small craft, and when about a quarter-mile from the lighthouse, the sailboat capsized. The moon was nearly full, allowing Mrs. Douglass and her children a full view of the accident, and their screams for help caught the attention of the marine reporters aboard the Herald, which was returning from up the sound with the shipping news of the day. Battered by wave after wave, Keeper Douglas was struggling to keep a hold of the bottom of his overturned craft, which was starting to develop a thin coating of ice, when he was rescued by the Herald and delivered to the lighthouse. The keeper and his family were profuse in their thanks to the rescuers, who almost certainly saved a life that evening. A couple keepers that served at Stepping Stones Lighthouse over the years received some notoriety. Ernest Bloom, who started his service at the station on April 20, 1910, was awarded the Lighthouse Service’s efficiency pennant for the meticulous manner in which he maintained the lighthouse. The pennant was flown next to the Stars and Stripes at the lighthouse in 1912 to honor Bloom for having the model station in the district. Keeper Stephen Holm served at Stepping Stones in the early 1920s and during his time rescued several unfortunate mariners. One example of his lifesaving skills occurred on July 18, 1923 when two men ran the sailboat Mistral onto the rocks just east of the lighthouse. 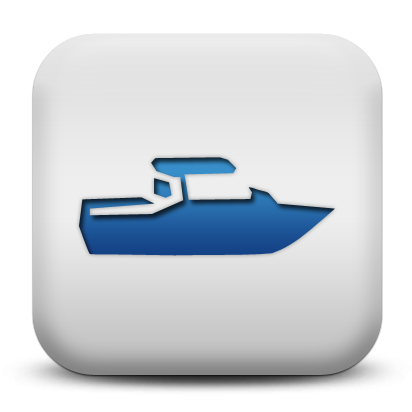 Holm hurried to rescue the two men, and later towed their damaged boat to Long Island. The previous year, Keeper Holm rescued two men whose canoe had capsized and transported them and their canoe to City Island, New York. Devil’s Belt has a tricky way of stirring up unexpected storms. 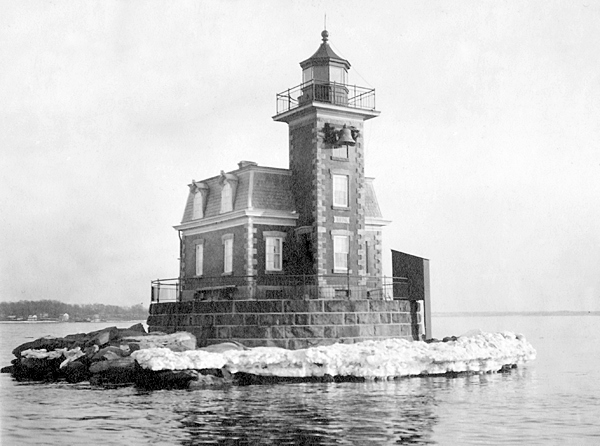 On the morning of February 9, 1934, the mercury at Stepping Stones Lighthouse hit fourteen degrees below zero. With the sound clogged with ice floes, Keeper Charles A. Rogers could not row ashore for supplies, and the weather only got worse. On February 20, the wind blew in a blizzard, which dumped seventeen inches of snow overnight, the worst storm since 1888. Trapped and with only two days of food for his small family, Rogers hung the flag upside down on March 1 hoping someone would notice the distress signal. Captain Wilson Rex of the tug Muxpet spotted the signal and gradually worked his vessel through the ice until he was close enough to carry on a signal conversation with the keeper. The captain offered Rogers food, but Rogers refused stating that it was the Lighthouse Service’s responsibility, and asked that the depot at St. George, Staten Island be notified of the situation. 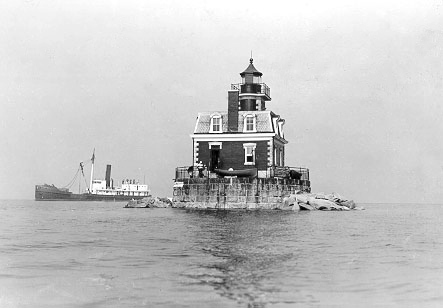 Shortly after being apprised of the keeper’s predicament, the depot dispatched the lighthouse tender Hickory to Stepping Stones Lighthouse with supplies. In 2006, the lighthouse, deemed excess by the Coast Guard, was offered at no cost to eligible entities, including federal, state, and local agencies, non-profit corporations, and educational organizations under the National Historic Lighthouse Preservation Act of 2000. The Town of North Hempstead submitted a letter of interest along with five non-profit organizations: Asian Americans for Equality in Manhattan, Beacon Preservation Inc. of Ansonia, Conn., Crabber Cup of Greenwich, Conn., Historic Preservation Society of America of Washington, D.C., and Korstad Marine Preservation Society of Brooking, Conn. Eventually all suitors save North Hempstead withdrew their applications, deciding it was too big an undertaking. 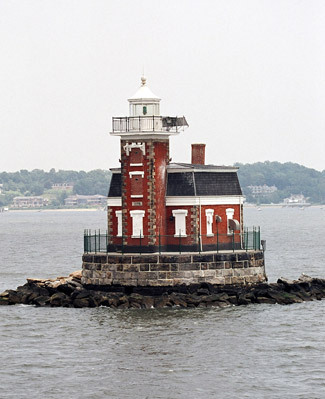 The lighthouse was awarded to North Hempstead in 2008, but three years later the National Park Service chided the town for not making progress on the preservation of the lighthouse. In October 2012, the General Services Administration requested the keys to the lighthouse so the structure could be inspected before being turned over to a new steward. Pam Setchell, president of the Northeast Lighthouse Preservation Group Ltd. And the Huntington Lighthouse Preservation Society, was seemingly going to be given the chance to do for the lighthouse what North Hempstead could not. In 2013, Setchell and North Hempstead decided to work together to try to save the lighthouse, which is in need of about $4 million in repairs. The Town of North Hempstead, the Great Neck Park District, and the Great Neck Historical Society forged a public/private partnership in 2014 that has invigorated the effort to save the light and has clearly defined appropriate tasks for the entities. Since the formation of the partnership, the society’s fundraising committee reached out to the City Island Maritime Museum, whose leadership has also committed to the preservation project. Essential repairs to the roof have already been completed and public awareness and fundraising efforts are underway. You can learn more about the restoration effort and make a donation to the project by visiting the Great Neck Historical Society website. In 2016, the lighthouse received a $165,000 National Park Service’s National Maritime Heritage Grant to help restore the structure along with $100,000 in state funds for constructing a dock that will improve access to the lighthouse. Today, wicked storms still race across the sound and mariners continue to be safely guided through a clear channel, past the hidden reef, by the faithful beam from Stepping Stones Lighthouse. Head: Finlay Fraser (1877 – 1879), James G. Scott (1879 – 1880), William McGloin (1880 – 1886), Cornelius Douglass (1886 – 1895), Elmer E. Gildersleeve (1895 – 1903), Charles Redfern (1903 – 1910), Ernest Bloom (1910 – 1915), Edward M. Grant (1915 – at least 1917), John E. Bergen (at least 1919), Stephen Holm (1921 – 1923), Charles A. Rogers (at least 1925 – at least 1934), Arthur M. Bettencourt (1936 – at least 1941). Assistant: John Taylor (1877), R. F. Morris (1877), John N. Buckridge (1877 – 1878), James G. Scott (1878 – 1879), Paul K. Williams (at least 1940). “Saved by the Herald Launch,” New York Herald, December 14, 1888. “Veteran Keeper of Lighthouse, The Day, October 5, 1910. Lights & Legends, A Historical Guide to Lighthouses of Long Island Sound, Fishers Island Sound, and Block Island Sound, Harlan Hamilton, 1987. Northeast Lights: Lighthouses and Lightships, Rhode Island to Cape Mary, New Jersey, Robert Bachand, 1989. 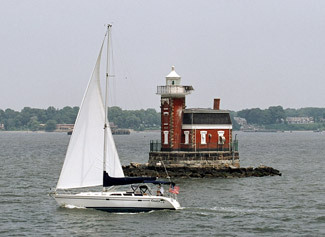 “Feds take lighthouse stewardship from town,” Jennifer Barios, Newsday, October 29, 2012. Located in the water near the confluence of the East River and Long Island Sound, off Long Island's north shore. For a larger map of Stepping Stones Lighthouse, click the lighthouse in the above map. Stepping Stones Lighthouse is best viewed by boat, but it is also visible from several points on the surrounding shore. The lighthouse can be seen from I-295's Throgs Neck Bridge, the U.S. Merchant Marine Academy at King's Point, and from the southern end of City Island. Cruises that pass Stepping Stones Lighthouse are offered by The Maritime Aquarium at Norwalk. The lighthouse is owned by North Hempstead. Dwelling/tower closed.